Kia Soul retuned for UK roads | What Car? The upcoming Kia Soul has become the first car made by the company to be specifically tuned for British roads. The Soul, which goes on sale in March, has been tuned by Lotus in a bid to improve its ride and handling on all types of UK road. Paul Philpott, managing director of Kia Motors UK, said: The result of our partnership with Lotus is a more composed ride which we think is much more suitable to what our roads can throw at Soul, and additionally, it is also a more exciting car to drive. Whatcar.com has a full review of the Soul prior to its retuning at Kia Soul hatchback. 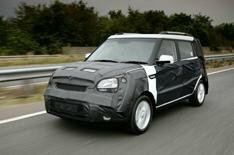 Come back to whatcar.com nearer the car's launch date for a full test of the UK-spec Kia Soul.